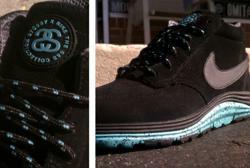 Pure Board Shop Has Released One Of The Hottest Street Boot Collab To Date, Nike And Stussy's SS Series. Nike and Stüssy introduce the S&S Off Mountain Series, showing up at Pure Board Shop. Pure introduces the new street boot collaboration from Nike and Stussy. As the Stussy x Nike OMS S&S Collection starts to trickle in and the first shoe to arrive at Pure's doorstep is the Nike Lunar Braata Mid. If not already familiar with the shoe The Lunar Braata is a mid top shoe designed to protect feet from harsh conditions with premium comfort all while looking good. The Collaborative effort between Nike and Stussy brings an all black suede water-resistant upper placed on top of a Lunarlon sole that has a nice speckled sport turquoise color, Hiker style laces, and the S&S Stussy logo placed on the tongue. Great subtle colorway on a great shoe. S&S is about duality. It’s about snow and street. It’s about sand and street. It’s about two different brands that changed the game. It’s also about movements. Stüssy and Nike represent different movements, both sub-cultural and physical — one founded on surf and skate, the other rooted in athletics and innovation. Since 2000, Stüssy and Nike have been working together to create dual-brand masterpieces using breakthrough cult favorites like the Huarache, Dunk, Blazer, Court Force and new innovations like the Free Trail as a canvas. Sometimes its been about amplifying the simplicity of a shoe with a luxury twist and sometimes its been about merging the old with the new for some hybrid theory. It’s a loose approach where hard work creates effortless results. A mutual respect helped create a vast collaborative game plan that became a norm. S&S is about sand, street and snow style merged for day to day performance. It's an existence that echoes the foundations of Stüssy. This collaboration flips classic cues and future favorites effortlessly with premium materials that emphasize lightweight, rugged style. It's about how you stand — from the swagger to the traction. Nike Free®, Lunarlon® and the legendary Waffle tread's assistance on cues from new innovations and cult classics. We can help you from the ankles down — the rest is up to you. Just do it and stand firm. The S&S Collection launched globally in limited quantities on Saturday, October 13. Pure Board Shop opened its doors on May of 2005. After co-owning Evolve Board Shops in Annapolis and Bethesda Maryland from 1993 to 2003, Robby Roberts put Pure on the streets a few years later. Its ease of access and parking make it a destination shop for riders and urban street wear fans alike. With their mix of products and variety in skate, snowboard , surf and exclusive street wear and shoe brands Pure’s customers extend far beyond their Annapolis location. Pure prides itself on customer service being its number one priority, with product knowledge and having the right product mix a close second. The store and the website feature an ever growing inventory from brands such as Nike SB, Nike Kaiju Snowboarding, Travis Rice,Lib Tech, Adidas skateboarding, Vans, Levis Skateboarding, Diamond Supply Co, HUF, LRG, Neff, RVCA and The Hundreds, as well as a large selection of Sunglasses and other accessories. The shop also prides itself on having the largest inventory of longboard equipment in the area; with brands like Landyachtz, Rayne, Caliber, Cult, RAD, Abec11 and many more. Pure puts on skateboard jams and video premieres at their local skateboard park as well as sponsors many longboard slide jams and races in the Metro Area.